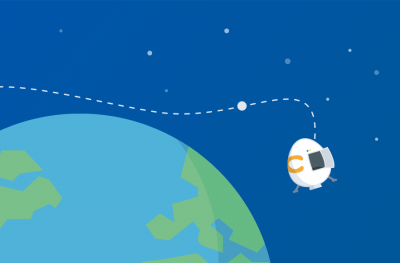 What’s your number-one need as a freelance Web designer—or as any business, for that matter? 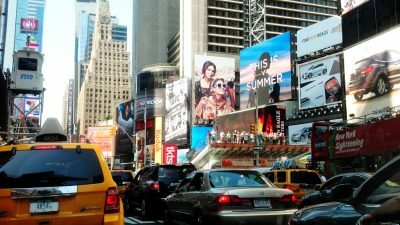 Is it better marketing or better skills? No. To be successful and profitable, you must be able to find and keep clients. Recently, I was reviewing a new program from 1stWebDesigner’s resident evil genius, Spence Forman. I liked it so much, I dipped into some of his other programs as well. One of the things that impressed me most was the practical business and marketing tips he sprinkles throughout them all. So I took the liberty of gathering a few of his best advice, mixing them with my own, and put together this list of 3 tips for getting and keeping clients. It goes without saying, your business model must be solid. You need a market that’s big enough to provide plenty of work. The people in that market must have a pressing need that you can fill. And they must be willing to pay you to fill that need. Of course, as a Web designer, you’re in a good place. Especially if you work with WordPress websites. It’s the world’s largest CMS with more than 70 million sites, and 20% of Internet sites use WordPress. What’s more, many of these people aren’t experts on website design or technology. They just want a website that works, so they can focus on their business. In most cases, they’re more than willing to hire someone to make that happen. So the market is strong, and the opportunity is great. Clearly, you have a market here. All that’s left is to connect with your potential clients and make an offer they can’t refuse. Here’s how. Finding and getting clients doesn’t happen by itself. You need the tools and connections in place to make prospecting as automatic as possible. It can be simple and have as many or few pages as you want. But when your ideal clients search for your services, you need to show up in the SERPs. Focus on providing a strong value proposition and customer-oriented sales copy. Make it as professional as possible—your website should showcase your skills. To build your credibility as an expert designer, you need to create content that showcases your knowledge. I recommend starting your own blog and, whenever possible, writing guest posts for respected blogs in your industry. Focus on developing name recognition and credibility. As your name become known, you’ll likely find that new projects come your way with little or no marketing—simply because people have read and liked your articles. Similar to content marketing is networking with your peers and potential clients. For this, there’s no better resource than LinkedIn. Create a keyword-rich profile, optimized with a professional image and description. Then get involved. Join appropriate groups related to your skills. Interact. Engage. Answer questions. By connecting with people on a regular basis, sharing resources and answering questions, you may find that work comes to you. 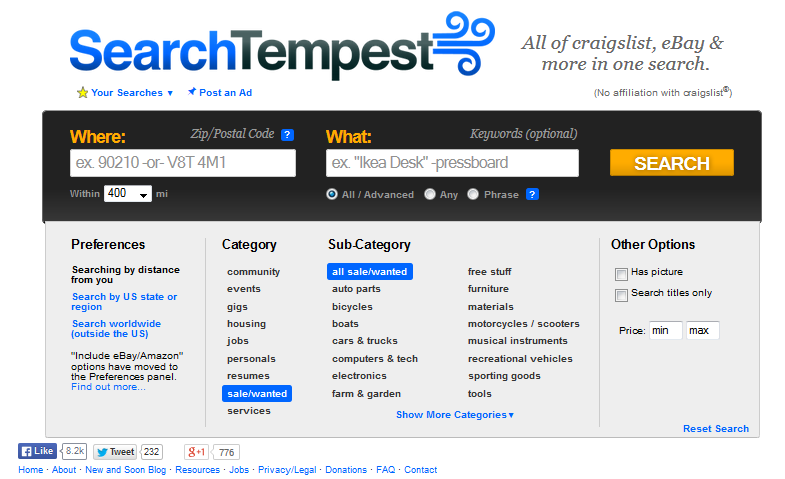 SearchTempest is a terrific research tool, allowing you to search for jobs on Craigslist, eBay and more. All you have to do is set the geo-distance (up to a 4,000-mile radius) and you can find listings in your area that match your skill set. Make it a goal to spend time each week reviewing job listings and connecting with prospects. By combining this with inbound marketing efforts (social media and blogging), you should be able to keep a steady work flow. Prospects want to feel you understand their problems and have the skills to solve them. But your skill set isn’t the only criteria for hiring you. When prospects are weighing two freelancers who are equal in every way, they’ll hire the one they like most. When dealing with prospects and clients, make sure you’re likeable. Every conversation, whether on the phone, by email or direct message, should show that you “get” your prospect. If you know their location, reference it. If they’re getting unusual weather, ask about it. If they’re in a different time zone, schedule calls relative to their time zone. You don’t have to be chummy, but you should be personal when dealing with clients. RightInbox makes it easy to follow up with prospects and customers and even to verify that emails made it to your intended target. Best of all, it integrates with Gmail to give you professional CRM system at little to no cost to you. Above all else, make every touch-point customer oriented. Whether people are reading your website, corresponding through email, or working with you on a project, focus on their needs, not yours. If it’s appropriate, take time to chat and get to know clients. Ask questions that help you understand their business goals. Then let them know how your services will help them achieve those goals. Pricing is always about value. If value outweighs price, people don’t mind paying. So your job is to deliver more value than people expect. Always. It can be little things, like giving progress reports during the project, asking for input at various stages in the project, or following up afterward to make sure there are no issues. I heard of another who sent an email with additional tips for getting the most from the work he had just completed. However you decide to do it, make sure clients feel they got the better end of the stick. And be sure to communicate that extra value when talking to new prospects. 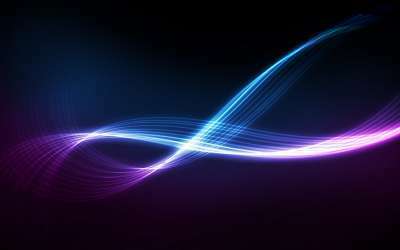 If you like these three tips, you’re going to love the materials at 1stWebDesigner. 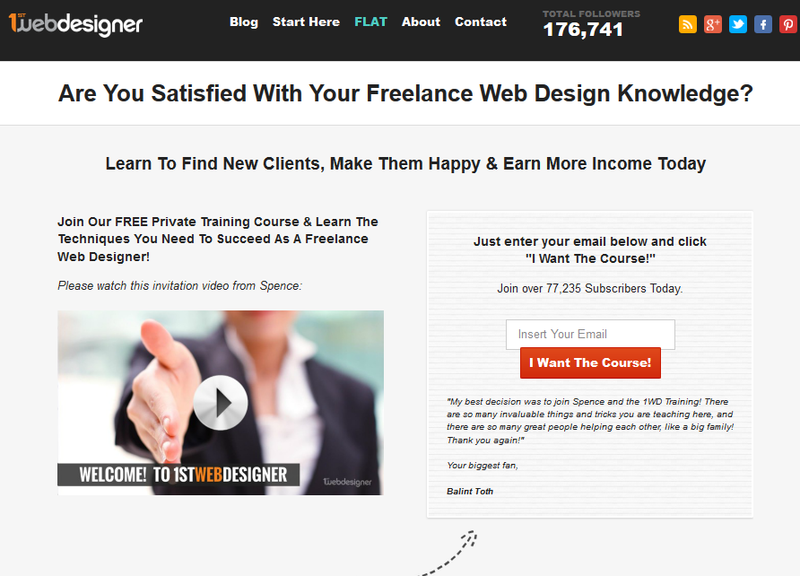 Visit 1WD.tv to review a variety of programs for building your design skills and helping you succeed as a freelancer. Need other business-building tools? Check out Maqtoob. What are your best strategies for getting and keeping clients? Share your winning ideas in the comments below.